Great for tailgates and casual get togethers, this Hot Blue Cheese Chip Dip is for all fans of warm, creamy, cheesy chip dip. With just a few minutes of time, a short ingredient list, and a small slow cooker to keep it warm, you'll be digging into this decadent dip again and again. Whisk together milk and cornstarch in a saucepan. Add 1 cup blue cheese, cream cheese, cream, Parmesan, lemon juice, Tabasco, and Worcestershire. Bring mixture to a boil over medium-high heat, whisking often. Off heat, season dip with salt and pepper; keep warm in a small (1 qt.) slow cooker. 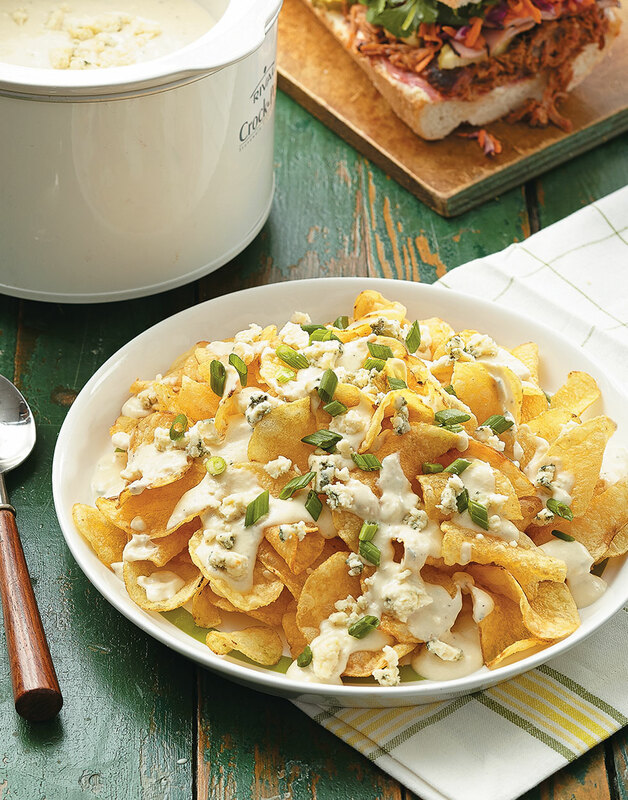 Serve dip over potato chips and top with scallions and remaining ½ cup blue cheese.